After seeing the mixed reviews for Disney’s $250 million “John Carter”, I wasn’t sure what to expect. It’s the kind of movie that you automatically expect to receive some unfavorable reviews. It’s a large-scaled science fiction epic and they simply don’t appeal to a certain group of people. I’m a pretty big sci-fi fan but even I had concerns going in to “John Carter”. Being someone completely unfamiliar with the source material, could the movie pull me into its enormous, sprawling world? Could Taylor Kitsch headline such a huge, ambitious project? Let me just say I was thoroughly drawn in right from the start of the film and Kitsch, while certainly not profound, does enough to get the job done. “John Carter” is based on of the Edgar Rice Burroughs novel “A Princess of Mars”, the first book of the 11-volume “Barsoom” series. The movie starts with Edgar Burroughs (Daryl Sabara) arriving in Richmond, Virginia after inheriting the estate of his recently deceased uncle, John Carter (Kitsch). Edgar hasn’t seen his uncle in years but he’s always cherished the wonderful stories he used to tell. Edgar is given a private journal that John Carter said was to only be read by his nephew. It’s through Edgar’s reading of the journal that we’re whisked away on the interplanetary journey that makes up the majority of the story. In the journal John Carter writes of his time prospecting for gold in the Arizona Territory after the Civil War. He’s taken into custody by a U.S. Calvary officer (Bryan Cranston) who wants to recruit him to join their fight against the Apache. Carter finds himself caught in the middle of a shootout between the Calvary and the Apache. He takes shelter in a cave where he finds not only gold but a mysterious medallion that ends up transporting him to what he later finds out to be Mars. He quickly finds that the planet is inhabited by a race of four-armed aliens called Tharks. Their leader, Tars Tarkas (Willem DaFoe) takes a liking to him and is especially intrigued by Carter’s newfound gravity-manipulating leaping abilities. We also learn that two humanoid cities, Helium and Zodanga, are at war with each other. At the center of the conflict is the beautiful Princess Dejah (Lynn Collins). Her father and Helium leader (Ciaran Hinds) is pressured into giving his daughter in marriage to an evil Zodanga general (Dominic West) in hopes that it will bring peace between the two groups. Dejah wants no part of it and of course John Carter finds himself right in the middle of it. The movie puts together a solid supporting cast of quality actors. In addition to DaFoe, Hinds, West, and Cranston we also get Mark Strong as the leader of the god-like Holy Therns, a sinister group of shape-shifting eternals who have been manipulating historical events on several planets. Strong is good here and he adds yet another solid “bad guy” performance to his resume. Thomas Haden Church has a lot of fun playing an evil Thark who desperately wants to overthrow Tarkas and gain power over the Alien tribe. But the main focus is on Taylor Kitsch. The first thing you notice is that he has all the physical attributes needed to play John Carter. He’s quite believable and he certainly knows how to handle a sword. The one thing I noticed is that he didn’t have a very wide range of emotions. The character is intended to be cold and reserved. But there are scenes that call for more emotion and Kitsch doesn’t add much to them. He’s not bad, but he doesn’t have a lot of charisma. I did buy into the chemistry between him and the lovely Lynn Collins. While her character is given a few pretty cheesy lines, she’s still pretty good and she shares some really fun scenes with Kitsch. While Kitsch may not necessarily stand out, the special effects certainly do. 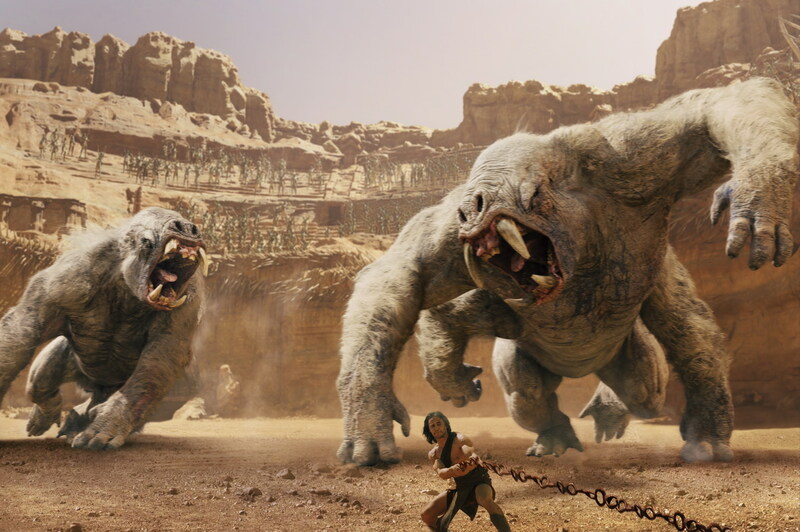 “John Carter’s” assortment of creatures look impressive and its alien technologies are a cool cross between futuristic and archaic. I was blown away by the detailed structure of the solar-powered air ships. I also really liked the CGI design of the Thark creatures. Director and co-writer Andrew Stanton, better known for his work at Pixar Animation, creates a planet that’s full of life yet that looks barren and on the verge of death. And while the landscapes do look fitting, they resemble an Arizona desert far more than what you would expect Mars, The Red Planet, to look like. Stanton’s Mars is also a place of a strained but structured social order. There are a lot of politics at work between the two humanoid cities and we even get a bit of rather corny social commentary along the way. Mars also has its system of theology that ends up helping Carter and Dejah along the way but I would be lying if I said I understood exactly how. But together, the politics and theology of the planet do make it more than just a wasteland full of monsters and little green men. It makes it’s inhabitation feel more structured and complex and I actually bought into it (with a slight bit of suspension of disbelief). 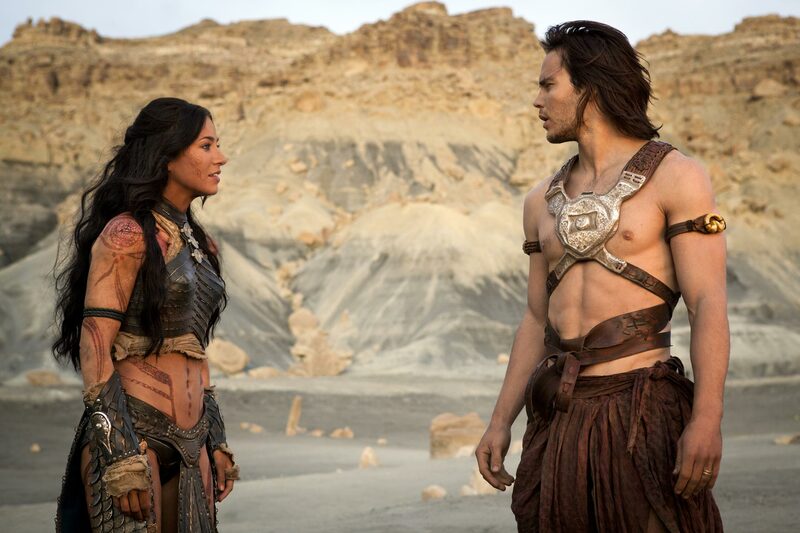 “John Carter” is the first big blockbuster of 2011 and it’s already been viewed as a “flop”. It’s mediocre opening weekend at the box office did little to cover the film’s $250 million price tag. But I have to say that I had a lot of fun with the film. I enjoy good science fiction and I feel this qualifies. 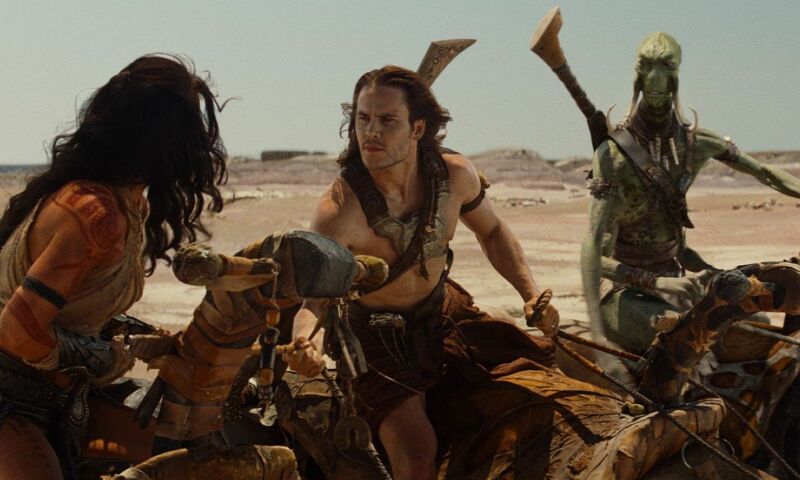 “John Carter” isn’t without its faults but it overcomes them by creating a huge new world that I had never experienced. I’ve never read Wright’s books but I think I could, and I certainly wouldn’t mind seeing “John Carter” become the full trilogy it was intended to be. I’m certainly not calling this the best movie of the year. But I’m also not calling it the terrible movie that some are. For me it was a creative and entertaining motion picture experience – the type of thing that makes the movies fun. This entry was posted in Movie Reviews - J and tagged andrew stanton, bryan cranston, ciaran hinds, daryl sabara, dominic west, edgar rice burroughs, lynn collins, mark strong, mars, movie review, science fiction, taylor kitsch, thomas haden church, willem dafoe. Bookmark the permalink. 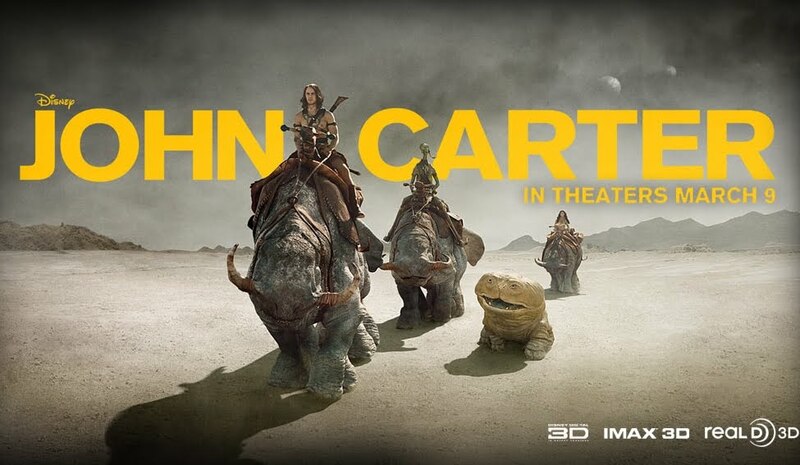 I think a lot of John Carter’s problem was the marketing upfront. I read an article about how it was so poorly marketed from the beginning, that even beginning box office numbers fell. Not to mention, a lot of people didn’t really know what John Carter was all about. I’m happy to read that this film is more than just “terrible” as many others have already deemed it. I enjoy a sci-fi flick here and there and will probably wait to rent it, although I can imagine it’s probably a lot of fun to watch on the big screen. I also had no idea that Haden Church, Dafoe, and Cranston were part of the supporting cast! I really enjoy each of those guys, so I look forward to it a little more now. Nice write-up, Keith. I don’t really get the “terrible” reviews unless they’re from those who really don’t like sci-fi. Like I mentioned in the review, it has it’s flaws. But overall I had a lot of fun with it. And sitting there watching my 10 year old son eat it up made it even better.